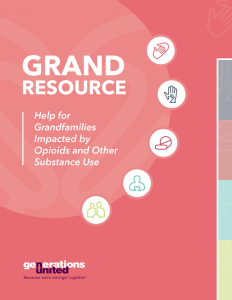 Grand Resource: Help for Grandfamilies Impacted by Opioids and Other Substance is a set of resources from Generations United that includes recommendations and resources on five topics identified by kinship caregivers as uniquely challenging for grandfamilies impacted by substance use. More than 2.6 million children are raised by grandparents, aunts, uncles, siblings, other extended family and close family friends who step forward to care for them when parents cannot. With the rise in heroin and other opioid use, more relatives are raising children because the parents have died, are incarcerated, are using drugs, are in treatment or are otherwise unable to take care of their children. The vast majority of children being raised by relatives live outside the formal foster care system. Yet the child welfare system relies heavily on relatives, so much so that about a third of all children in foster care are living with relatives. After years of decline in the overall numbers of children in foster care, the numbers began to rise in 2013. Experts say the opioid epidemic is responsible for this trend. Relatives are being asked to care for more children in foster care than ever before. And children placed in family foster care because of parental drug or alcohol use are now more likely to be placed with relatives than non-relatives. In 2016, more than a third of all children who were removed from their homes because of parental alcohol and drug use were placed with relatives. Yet the impact of parental substance use disorders on grandfamilies is not a new challenge. Grandparents and other relatives have long provided an essential safe haven for children whose parents have been unable to parent due to alcohol or other substance use and have stepped forward for children during each drug epidemic, including crack cocaine, methamphetamines and opioids. Grandfamilies affected by substance use disorders face a range of unique social, financial, physical and mental health challenges. Despite challenges, the growing reliance on grandfamilies is best for children whose parents cannot raise them. Decades of research repeatedly confirms that children who cannot remain with their birth parents thrive when raised by relatives and close family friends. These children have more stable and safe childhoods than children raised by non-relatives. Yet relative caregivers often receive less access to supports, benefits and services to help the children, who often come into their care after experiencing significant trauma that brings significant physical, mental and behavioral health challenges. This resource is designed to provide tips, useful information and a list of additional resources to help grandfamilies both inside and outside the foster care system impacted by opioids or other substance use.